Heat the oven to 350 degrees. Beat the cake mix, 1 cup of pumpkin, milk, oil, eggs and 1 teaspoon of the pumpkin pie spice. Pour the batter into greased and floured 9 inch round pans. Bake for 28 to 30 minutes or until a toothpick inserted into the middle comes out clean. Cool in the pans for 10 minutes. Remove the cake from the pans and let cool completely. Beat the cream cheese in a medium sized bowl with a mixer until creamy. Add sugar, remaining pumpkin, and the remaining pumpkin spice. Mix well. Gently stir in cool whip. Cut each 9 inch round cake in two. Spread the cream cheese filling between the layers. Do NOT frost the top layer. Instead, drizzle caramel topping and pecans over the cake just before serving. Refrigerate the left-overs (if there are any). 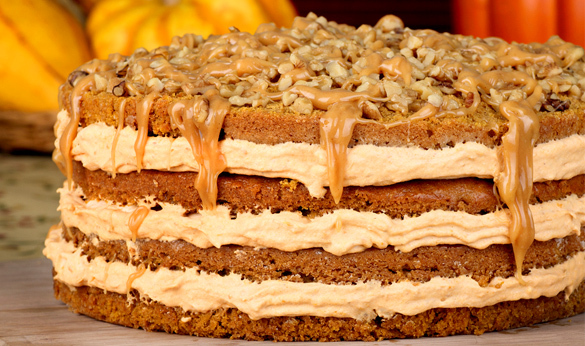 Enjoy this pumpkin layer cake recipe.